Prodir Promotional Pens offer a wide range of stylish and striking designs of pen. Whether you want a low value but memorable giveaway, colleague or client reward or a gift boxed Executive quality writing instrument Prodir have already made that pen for you. Prodir Branded Pens are designed in Switzerland using high design concepts. Every model of pen has depth of thought and consideration built into every aspect of its construction. Prodir Ballpens are totally sustainable and refillable with a universal replacement cartridge. Promotional Prodir DS1 Pen has a stand out 'dot' optional design feature to the clip. It has a four..
Prodir Promotional DS3 Biotic Pen increases your positive corporate values with our eco-friendly o.. Promotional Prodir DS3 Pen is our most popular pen with its twist ball action and wide choice of co.. 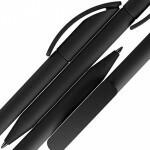 Promotional Prodir DS3 Soft Touch Pen is our tactile twist on the popular DS3 range. Still with the .. 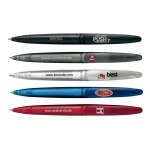 Promotional Prodir QS01 Ballpen has a tactile triangular texturedsurface that makes it a joy to hold.. 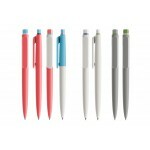 Promotional Prodir DS5 Pen has a distinctive tactile soft touch barrel to enhance your writing exper.. Promotional Prodir DS9 Pen has a stand out polished 'ring' design feature around the clip in 20 poli.. 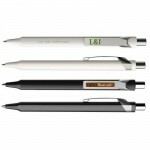 Promotional Prodir DS7 Pen has an irresistible sliding push button action feature which clients and .. 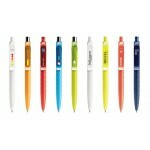 Promotional Prodir ES2 Pen has a radical rounded polished triangular body with silver satin metal cl.. 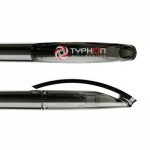 Promotional Prodir QS03 Pen is targeted at the automotive industry with its tyre tread pattern soft ..